I wonder how many Wade collectors there are world wide? The Wade Collectors Club have some 10,000 members but there are a significant number more who are not affiliated to any organization but do still, collect Wade. They can be seen ferreting out pieces at car boot sales, flee markets, collectors fairs and the like. (Pictured – Some Irish Wade -click on image for more details). A lot of the interest in collecting Wade is the pursuit, searching out those elusive little figures to make up a set or series. At the other end of the scale are the limited edition figurines which, if purchased wisely, are an excellent investment, better than a savings account! One branch of Wade collecting which, in the past, has rather taken a rear seat is Irish Wade. Collectables produced in the Burslem factories have always been more popular generally than those which came from the Irish factory. What some collectors are unaware of is that a great deal of Wade marked “England” was, in fact, produced in Ireland. In 1946, George Wade asked his eldest daughter Iris and her husband Henry Straker Carryer to oversee a new factory in Portadown, Northern Ireland. Recently, Iris Carryer told me the story herself. ” In England, just after World War II , pressure was brought to bear on manufacturers to start new industries in areas of the United Kingdom that were described as “depressed.” That was where unemployment was high. My husband and I had already made plans to leave the UK for a new life in California and my husband already had a job lined up so it was much against my wishes when my husband was persuaded by my father to purchase a factory for him in Northern Ireland and then establish and organize the new business. So from 1946, just after World War II, until 1964, I worked in the Province alongside my husband. Team building was his specialty, and, because of his talent, we were able to steer quite a happy ship through the always troubled waters of the British part of Ireland. My husband taught me to respect other people’s opinions, whatever their class, colour, creed or country, regardless of whether one actually liked or agreed with them or not and I believe I taught him that the female of the species is often a lot more intuitive than the male! The Irish branch of the Wade Group of Potteries was established purely for the manufacture of electrical porcelain insulators. The highly technical making of these had no artistic appeal or interest for me, but very soon after we arrived in what turned out be an unexpectedly foreign country, we were hit by an almighty slump. New housing came to a standstill, government contracts were cancelled, it was depression time again, especially for people whose hopes had so recently been raised. In Northern Ireland, brand new machinery stood idle. ‘Could we possibly use it to make something ornamental, like the little animals I had in a Noah’s Ark as a child?’ I inquired tentatively. With Henry Straker Carryer as Managing Director and his wife Iris, Art Director, high quality gift ware, now extremely collectable, teemed out of the factory for a period of some fourteen of their seventeen year stay in Northern Ireland. From the early days the factory was a success, so much so that on 2nd January 1950 it became a private limited company called Wade (Ulster) Ltd. It was the time of the coronation of Elizabeth II and Wade (Ulster) LTD, like many other potteries, decided to throw themselves wholeheartedly into producing gift ware to commemorate the event. There is a famous story of the wrong glaze mixing being responsible for the now well known “Irish” look to the products, but this was an unintentional bonus and made the product unique. With the success of the coronation gift ware, other products were introduced, much of it in the distinctive green/blue Irish glaze which is easily identifiable. The huge amount of gift ware produced at the Portadown factory over the years was all made with a great deal of affection for the finished product which is evident in everything they made. Each little piece, whether a simple vase or dish or the highly sought after alphabet train, which was also made at the factory, was made with a dedication second to none (with perhaps the notable exception of Hagen-Renaker of the USA). A variety of back stamps were used during this period including Irish Porcelain, Made in Ireland by Wade , Co. Armagh; Shamrock Pottery, Made in Ireland; A Moko Line by Wade, Ireland; Celtic Porcelain by Wade, Ireland and a number of other combinations, indeed at one stage no back stamp was used! This situation arose because a lot of the production at the Wade (Ireland) factory was for the Wade, England company and therefore carried the Wade, England backstamp, a situation which infuriated Iris Carryer as she described above. This came to a head when the parent factory in Burslem ordered Irish Leprechauns with a Wade, England back stamp. Sir George’s daughter felt that items made at her factory should carry an Irish back stamp and an Irish Leprechaun most certainly was not going to leave the factory with Wade, England on it! Until a compromise could be reached, figures left the factory minus any markings. 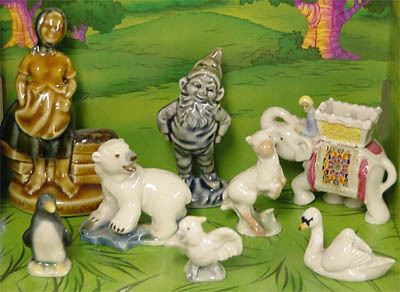 Iris won the day and thereafter all figures were clearly marked, although Ireland continued to produce a substantial amount of Wade, England gift ware. Iris, with her background in ceramics, had always admired the intricate workmanship and good value of the H.R brand and was of the opinion that the product sold itself. It was at this time that she became good friends with Maxine Renaker, wife of the then president of the company, and her daughter Susan (now president of Hagen-Renaker), a friendship which continues to this day although Iris has long since ceased to represent the company. It was also through this connection with Hagen-Renaker that Wade (Ulster) LTD came to produce wall plaques. Following discussions with Iris Carryer, Maxine Renaker sent some molds to the Portadown factory where it was hoped that Wade could produce them in porcelain. This however became something of a nightmare as during the cooling process, afte r being removed from the kiln they cracked. As Iris explained to me, “It was awful, Ping, ping, ping! They were all cracking as they cooled down.” This was due to stress on the porcelain which, as it cooled, had the effect of pulling it apart and thus the cracks appeared. None of the Wade wall plaques ever went into general production and few were ever sold, however, those that do exist, realize extremely high prices at auction or when privately offered for sale. Those known to exist all carry the Wade, CO Armagh backstamp. Henry Straker Carryer and Iris ran the Wade, (Ulster) plant until 1964 when they decided to realise their dream and move to California. For some years after their arrival in the USA they were Southern California representatives for Hagen-Renaker Potteries whilst still keeping their business eye open for Wade. Indeed, it was Iris Carryer who commissioned the Painted Ladies (San Francisco houses) under the name of Carryer Craft of California as well as the San Francisco cable car. It was part time employment in the first years of their retirement and they loved it. Iris continues to live in California where every day seems to be like a beautiful English summer’s day. She writes a lot, reminiscences of her long life, interesting events and people she has known and has been featured a number of times recently on Home Truths for the BBC. Following a visit to her at her home, we correspond a lot now, me inquiring, she recalling – as clearly as if the events were yesterday instead of many years ago. I recently asked her if she had ever met Clarice Cliff. “Met her,” she replied “I remember the swishing hem of her long black dress, the orange, jade green, royal blue and yellow of the numerous chiffon scarves that rainbowed round her slender neck and floated yards behind her until they almost tangled with the boring beige tweeds and twin sets of the rainy morning shoppers in our dreary Staffordshire market town. I remember her hat, large, black and smothered in scarlet poppies. I was thirteen years old. Who is that I asked my mother? ” “That my dear is Clarice Cliff,” she replied,”Looking every inch like her products, Bizarre indeed!” I am glad I asked Iris that question! Now a widow in her 80’s, Iris Carryer remains a person of great wit and intellect whose years have not diminished her joie de vivre – long may she remain so.